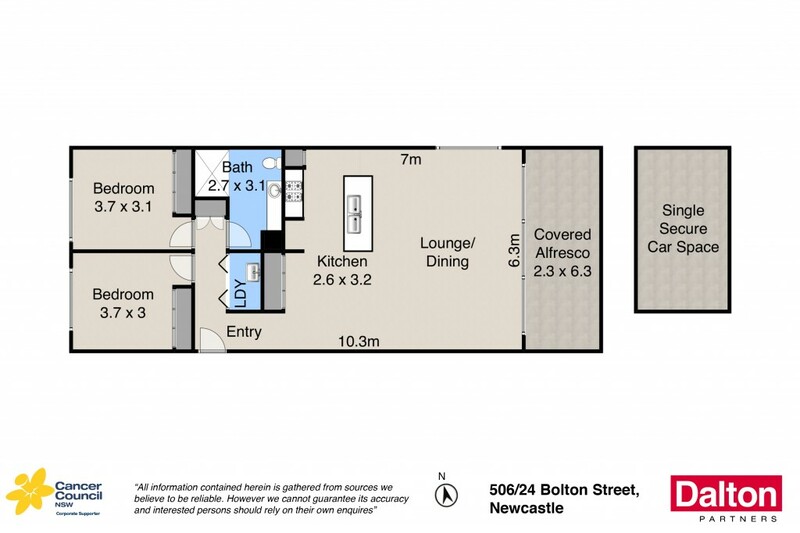 Occupying a top-floor position and a perfect north-easterly aspect in the landmark City Extra building, this spacious inner-city apartment captures views over Newcastle's city skyline. With contemporary open plan living spaces, two peaceful bedrooms, a modern bathroom, internal laundry and fabulous outdoor entertainers terrace, it delivers an outstanding locale promising prestige and pure convenience. Investors and lifestyle-conscious buyers will find tremendous appeal in an address that's mere metres from lively cafes, wine bars, dining options and Newcastle Beach. * Crisp open plan living space with effortless outdoor connection. * Wide north/east facing terrace captures vibrant cityscape outlooks. * Two well-proportioned bedrooms fitted with built-in wardrobes. * Contemporary kitchen with quality Fisher and Paykel appliances. * Main bathroom with walk-in shower plus separate internal laundry. * Split-system air-conditioning, intercom entrance and lift access. * Designated single car space adds instant appeal. * An unbeatable 'walk-to-everything' east-end location.